Once upon a time in Europe, there was a League and there was a Team played in it. Mounted in the mountains of Scotland, the Scottish Claymores! 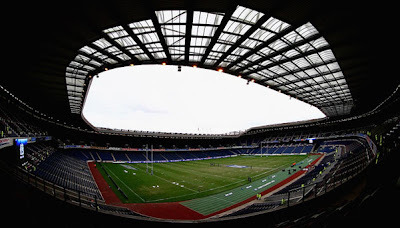 The franchise played in the World League of American Football (later renamed NFL Europe) between 1995 and 2004, initially playing all home games at Murray field Stadium, Edinburgh and latterly sharing home games with Hampden Park, Glasgow. The Scottish Claymores are named after the historical two-edged sword, formerly used by warriors of the Scottish Clans. In ten seasons of NFL Europe play, the Claymores reached the World Bowl on two occasions, with victory in World Bowl IV but defeat in World Bowl VIII. The Claymores experienced several notable swings in fortune during their ten years. Their World Bowl-winning season of 1996 was the league's first worst-to-first turnaround: having finished 1995 with a 2-8 record and no wins at home, the 1996 Claymores went 7-3 in the regular season and won all their home games. Equally remarkable was the contrast between their first home games of the 2003 and 2004 seasons. 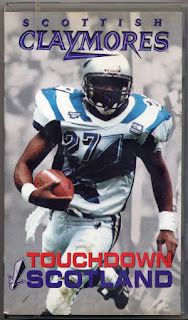 In week 1 of the 2003 season, the Claymores defeated the Berlin Thunder 62-31 - the highest scoring game in NFL Europe history - but in 2004 their home opener was a 3-0 defeat at the hands of the Amsterdam Admirals, tying the record for the league's lowest-scoring game. On October 21, 2004, NFL Europe announced that the Scottish Claymores would be discontinued in favor of a franchise in a more competitive German market. While Scotland's attendance average over their 10-season history of 11,306 was comparable to some Scottish Premier League clubs, teams in Germany were able to consistently bring in more support. Scotland was ultimately replaced by the Hamburg Sea Devils on November 24 for the 2005 NFL Europe season. Despite closing, the Scottish Claymores identity is being maintained to induct players to their Hall of Fame, and as a means for promoting amateur American football in Scotland. During their ten seasons playing in Europe, Claymores had a few very interesting players in their Clan! OL Joe Andruzzi ,played in season 1998. ( Green Bay Packers ,New England Patriots, Cleveland Browns ) Three-time Super Bowl champion. Claymores, Long may your memories run!! !